ZEMKE Colonel Hubert, Distinguished Service Cross, Silver Star with Cluster, DFC with six Clusters, DFC (British), Purple Heart, Legion of Merit, Air Medal with three Clusters, Croix de Guerre (French & Belgian). 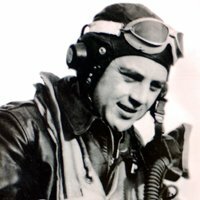 In September 1942, 'Hub' Zemke took over the 56th Fighter Group, the first unit to receive the P-47 Thunderbolt. The 56th flew its first combat mission in April 1943 and that summer escorted bombers of the 'Mighty Eighth' to Germany. Zemke proved himself to be such an outstanding leader and tactician that, by the end of the war, his 'Wolf Pack' was the top-scoring Fighter Group in Europe and its gallant leader was credited with 19 victories before he was brought down in October 1943.